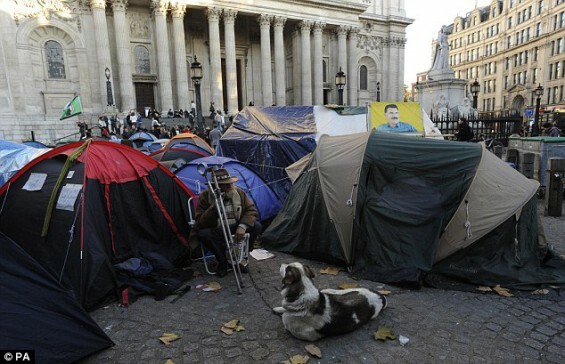 How did the #Occupy protesters thank their hosts at St. Paul’s Cathedral in London after a month of squatting in the church yard? They crapped inside the cathedral. Today the Archbishop of Canterbury Rowan Williams says Jesus would have joined the #Occupy protesters… After they crapped inside his cathedral. Archbishop of Canterbury Rowan Williams says Jesus would have joined protesters from the anti-corporate Occupy movement who have been camped outside London’s St. Paul’s Cathedral for more than seven weeks. The demonstrators pitched their tents outside the iconic cathedral in mid-October to protest what they see as the unfairness and illegalities of the global financial community. In his article written for the Christmas edition of the Radio Times magazine, the archbishop said Jesus was “constantly asking awkward questions” in the Bible. Good grief… Archbishop Williams is just nuts.